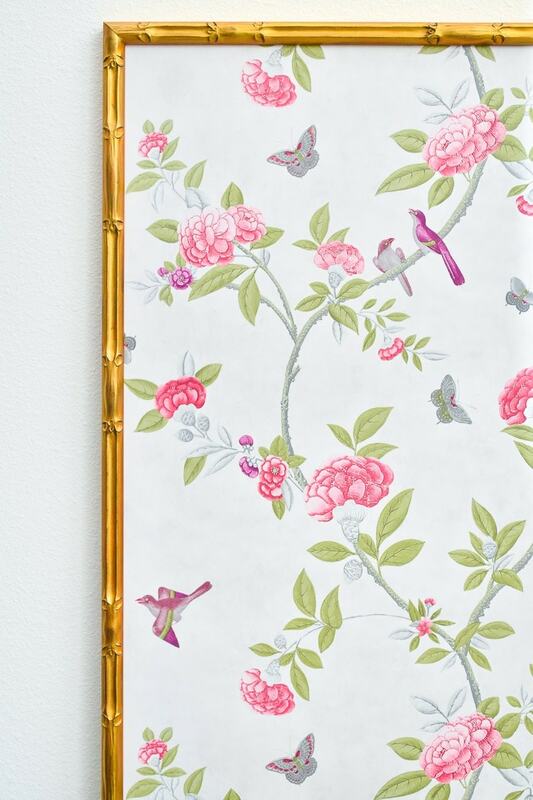 I have been obsessed with the gorgeous framed chinoiserie wallpaper panels that you see in high-end, luxury homes. They’re usually so feminine, impeccably chic and hand painted, which makes them prohibitively expensive. 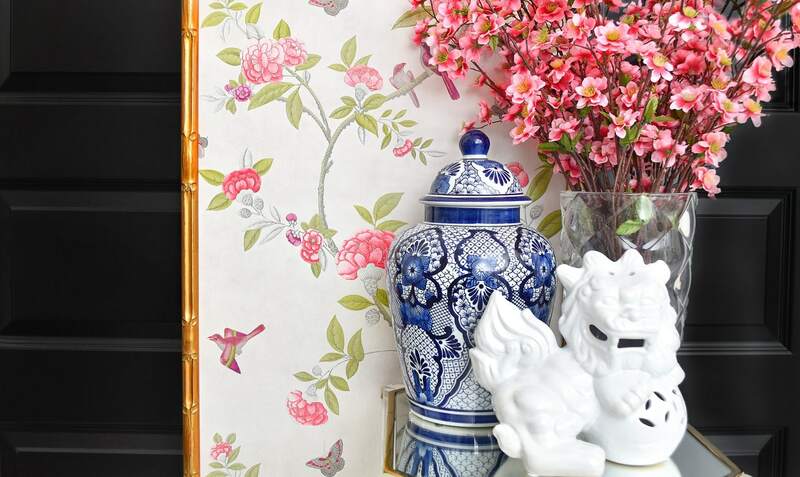 I was determined to find a way to DIY these chinoiserie wall panels for a lot less and share the tutorial with you all, which is what we are all gathered for here today. 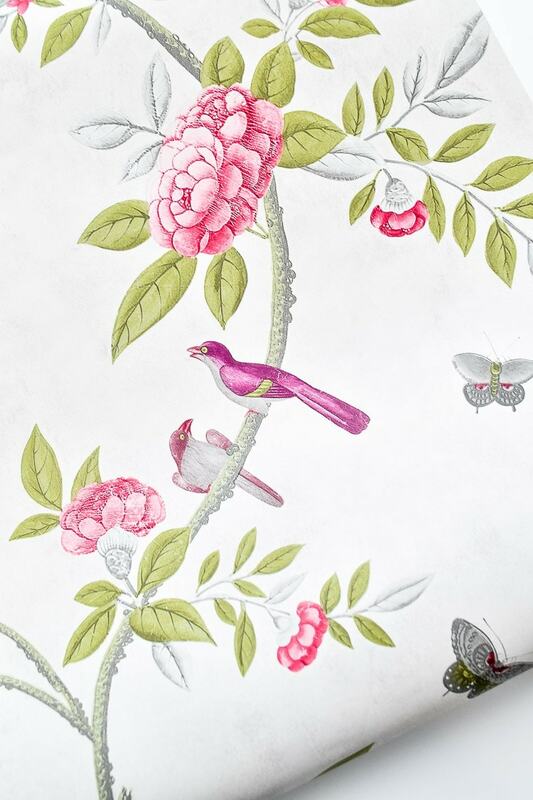 I’ve been hoarding some floral chinoiserie wallpaper from Graham & Brown for awhile just for this sort of project. 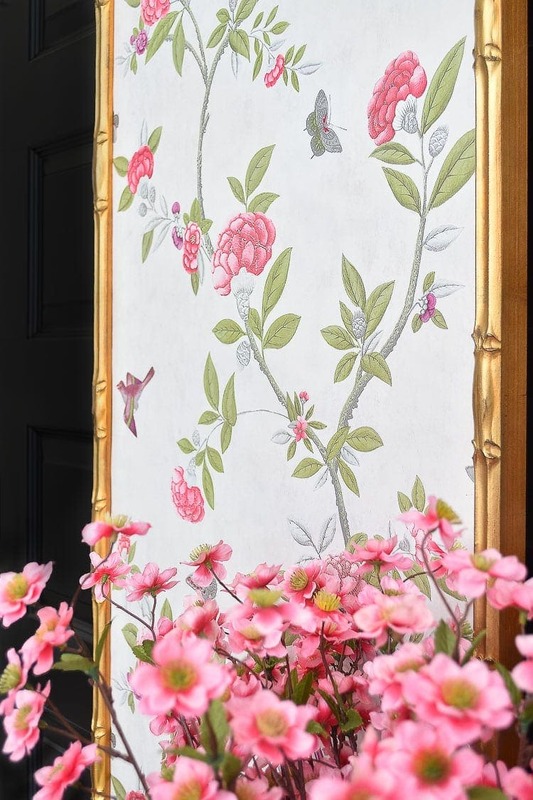 I’ve been hoarding it so long that this particular pattern is no longer made, but they do have some gorgeous chinoiserie wallpapers online that are similar . These panels are going to be the main wow piece on my accent wall in my home office makeover. 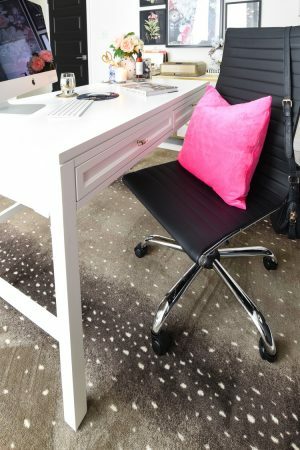 You may be asking yourself, “Didn’t she redo her home office in January?” and you’d be correct. However, it was a super simple face lift, and this is going to be more involved with painting a wall and getting a fantastic new rug, which I’ll be talking about in a post soon. 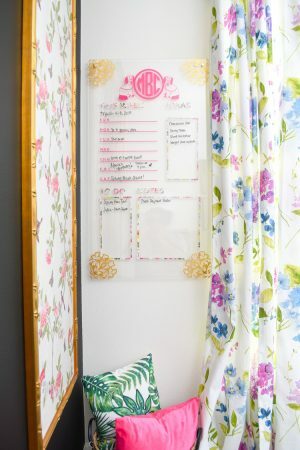 When thinking about how to DIY these chinoiserie wall panels, I kept wishing someone sold giant bamboo frames to make this whole process easier. Initially I was going to settle for just buying some simple trim at the hardware store and building the frames myself, but I really, really wanted bamboo. 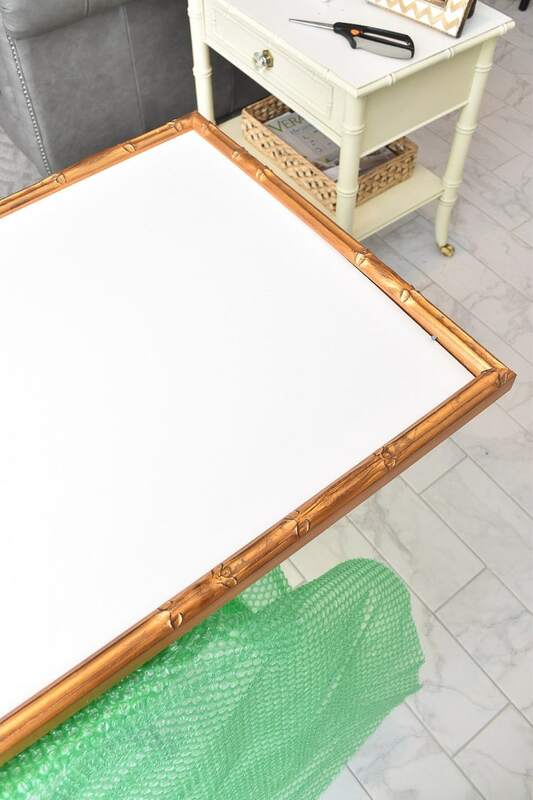 One evening, a Google search led me to PictureFrames.com where I found the most perfect bamboo frame. It’s thin, gold and available in custom sizes. In fact, they have over 800 (!!!) different frames to choose from, a fantastic design blog with tons of art/framing inspiration, and are a zero-landfill company. Nothing from any of their orders goes to waste, and I love when companies are Eco-conscious. I reached out about my idea for this project, and they graciously agreed to provide the frames and foam core board. The frames came in perfect shape and packed to ensure zero damage. 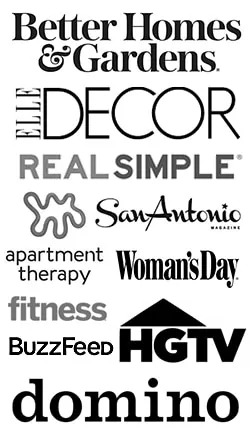 Putting these together was actually a really easy project that is perfect for both skilled and novice DIY-ers. No power tools are needed, and you can knock out a pair of wall panels in under 90 minutes or so. My office has nine foot ceilings, so I opted to have the frame opening be 20″ by 72″ tall. The 20″ width meant I only had to trim about a 1/4 inch of wallpaper off each side, but you’ll learn more about that in the tutorial below. 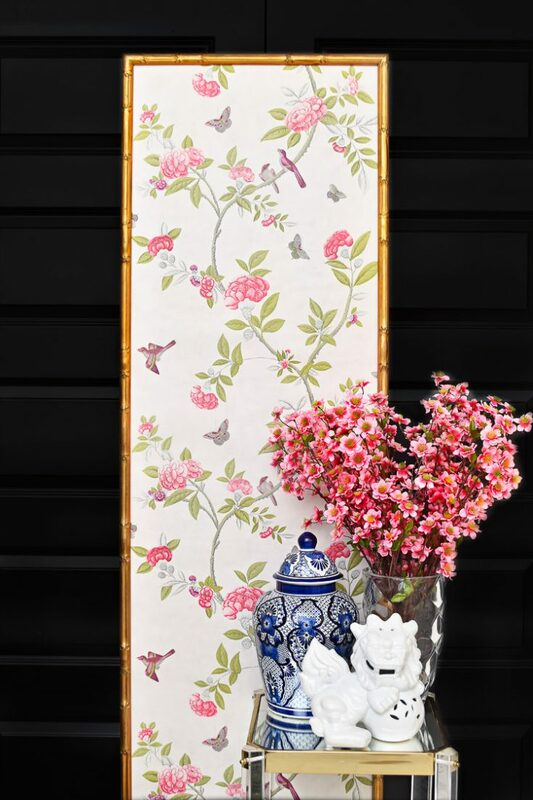 Making DIY bamboo framed chinoiserie wall panels is an easy project when you use a ready made frame and wallpaper. I love the frame I chose, but it had a bit too much orange in the finish, so to tone it down I decided to do a light layer of gold leaf rub n' buff. You can see the difference below. 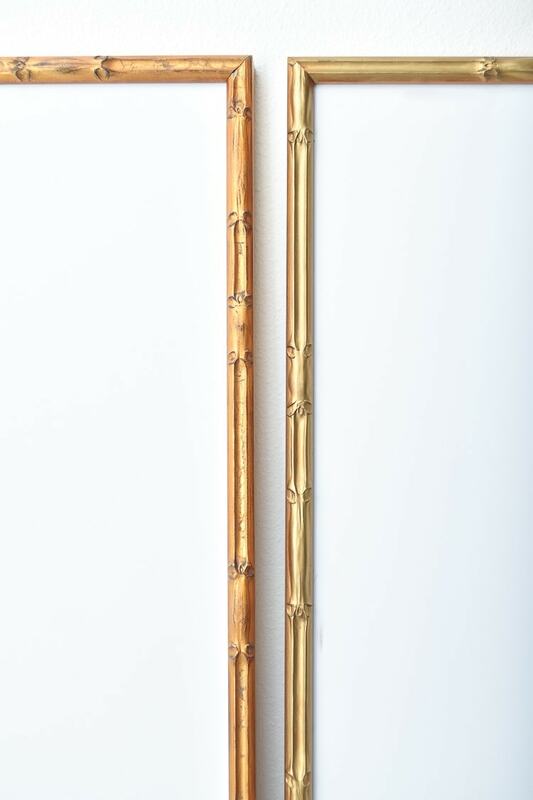 Left is the original frame and to the right is the gold leaf version. If you've never used rub 'n buff before, it is potent stuff! A pea sized amount did about 18" sections, and I used a white cleaning cloth to buff it on. A little truly goes a long way. Once that is complete, you'll want to remove your frame so you only are working with the foam core board. 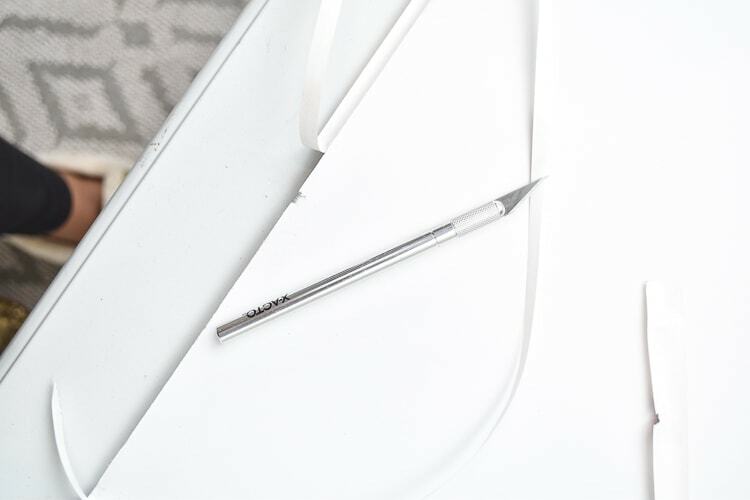 A flat head screwdriver comes in handy to undo all the tabs that hold it into place. 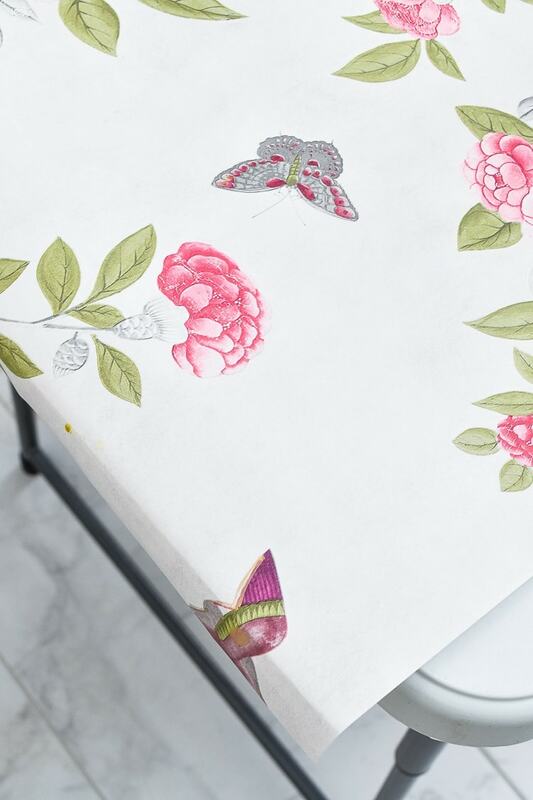 Grab your wallpaper and unroll it onto the foam board. This is where you'll position it where you want the pattern to line up and trim. IMPORTANT: leave about three inches of overhang on top and bottom. I wanted to include as many birds as possible into my panels, so that was my approach. 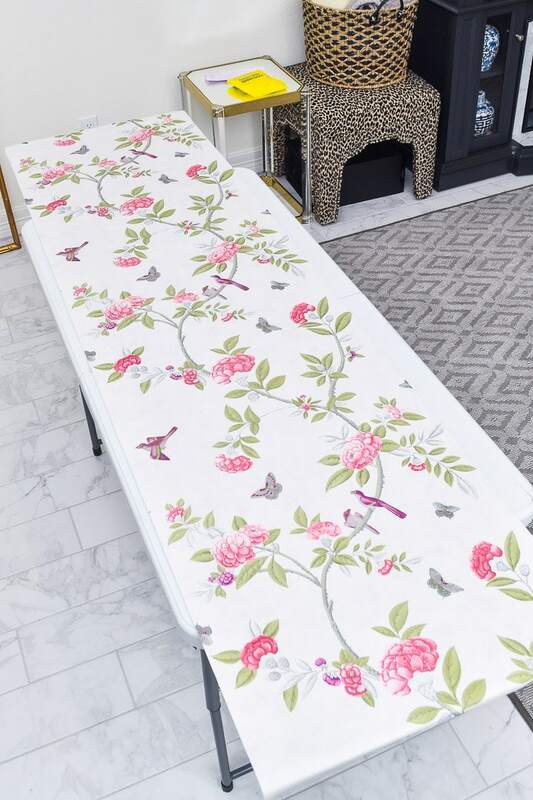 With the wallpaper in place, lightly crease the top edge of the wallpaper so you know where your top is for the next step (which involves the adhesive, so you'll want to work quickly- the creased edge will serve as a guide). Set the wallpaper aside where it won't get sprayed with adhesive. Working in halves, top first then bottom, spray a light layer of spray adhesive onto the foam core board. Position your creased edge into place at the top and gently smooth the wallpaper into place over the adhesive. 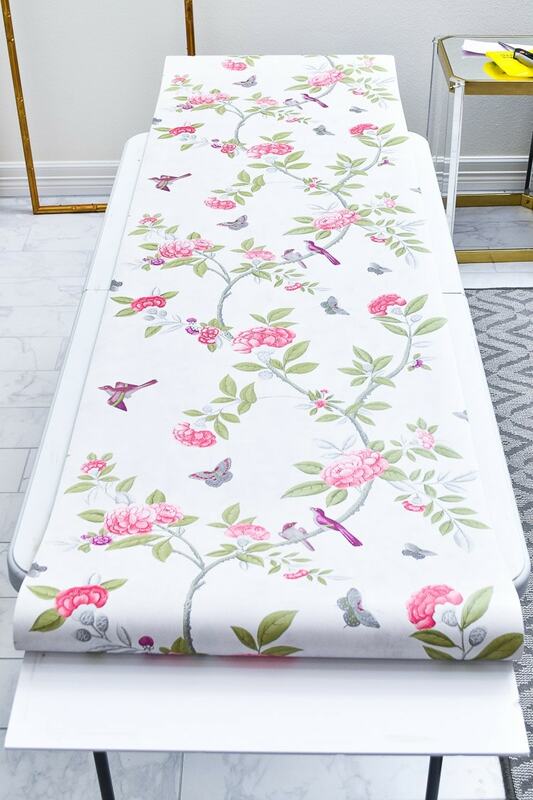 Lightly flip over the bottom half of the wallpaper so its resting on the top (BUT DO NOT CREASE) and spray the bottom part of the board. Smooth into place. Note: Spray adhesive does stay tacky and repositionable for a short amount of time, BUT I recommend working quickly while ensuring your pattern stays straight. 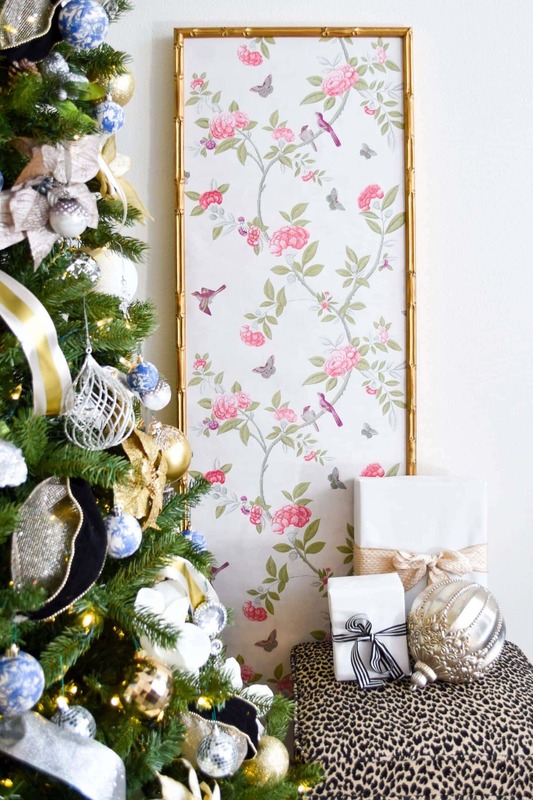 Flip your board over so the wallpaper is facing down and use a craft knife to trim away excess wallpaper. 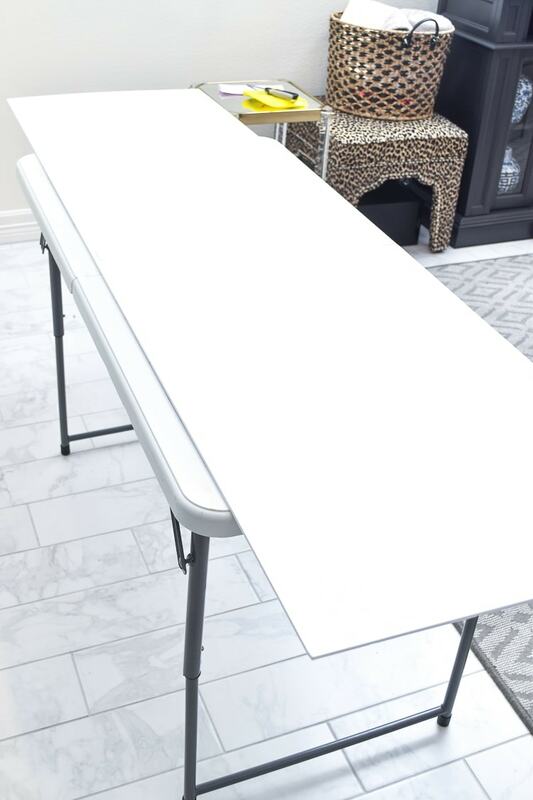 This will scratch your table, so either put down cardboard underneath or use a work bench/work table. 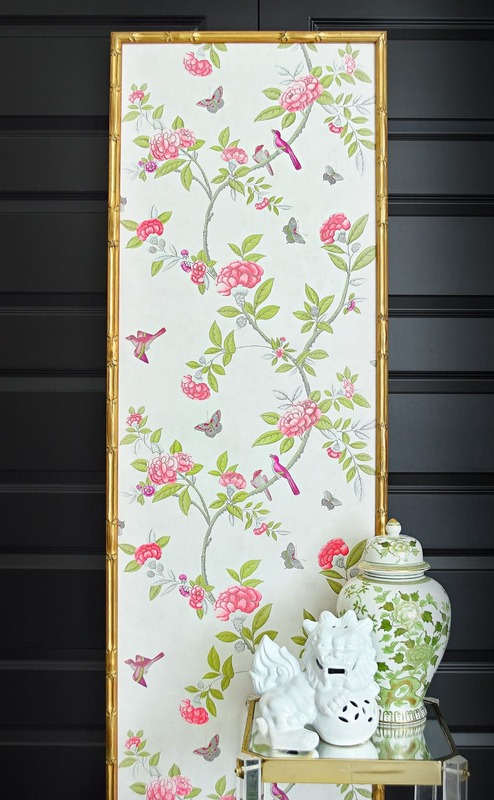 Carefully put the wallpaper panel into the frame and use a flat head screwdriver to push the tabs into place to secure your chinoiserie art. Hang using a sawtooth hanger or picture hanging strips (these are very lightweight). I still have to paint my office accent wall, which will be black, so for now I positioned a panel against my black doors so you’ll kind of see the dramatic effect I’m going after. I put the other by my chinoiserie Christmas tree with my blue and white DIY ornaments, and it totally works there, too. 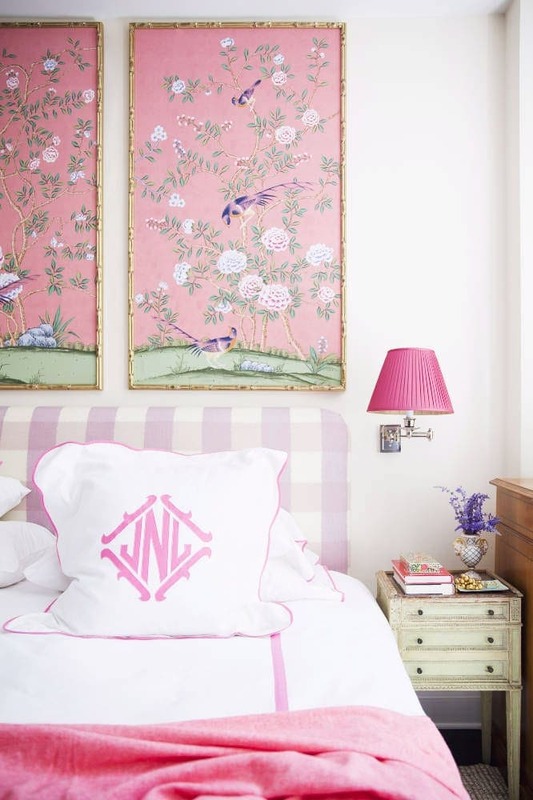 I love the bold pink and purples paired with the very light gray background on the wallpaper. And the birds…gosh, I am so smitten with those birds. This wallpaper is so me! And you all know I simply had to stage it with a foo dog and ginger jar to show you all that chinoiserie doesn’t have to totally revolve around blue and white. My goal is to have this office makeover done by mid-December so I can have a very happy holiday season and relax with my loved ones. 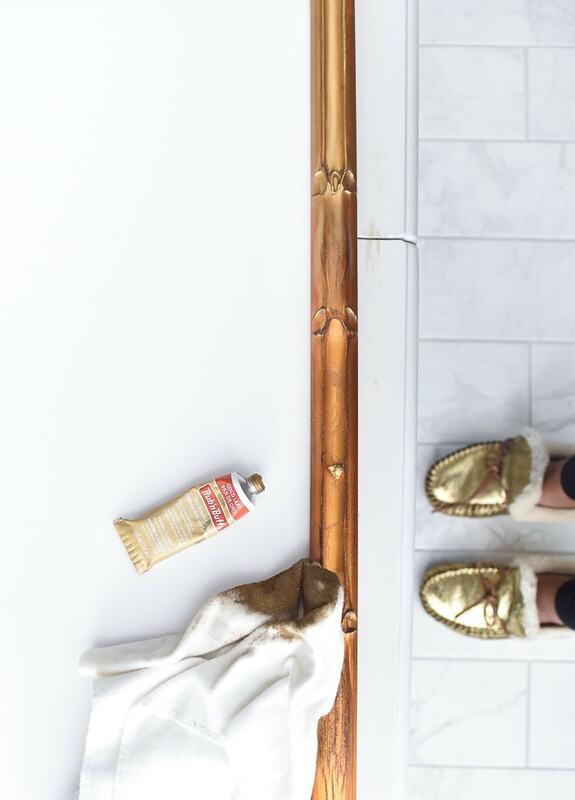 I have a few more DIY projects up my sleeve for this makeover, and I hope you’ll follow along to see it all come together. 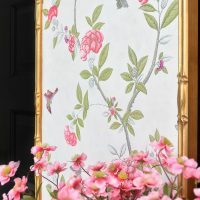 Don’t forget to check out PictureFrames.com for your DIY chinoiserie wall panels- they’re always having amazing sales, have a huge assortment and can do custom sizes! Plus, it’s perfect for large scale DIY projects like this one. These panels turned out beautifully! I’ve been wanting to make some for our dining room, so thank you so much for this affordable DIY! Love this DIY so much Monica!!! I may have to do another one in this size for me entry! I had a feeling the panels were wallpaper when I saw you post on instagram but I was seriously admiring the bamboo frame and was like ok but where do I get reasonable bamboo frames and then BAM!! Here they are!! 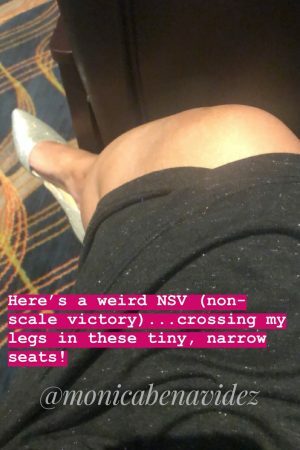 Thanks for sharing with us!! Annnnd I die – I’ve been wanting similar panels as well and I’ve been searching sites/antique auctions that are just so expensive! Heading to that frame website ASAP! Thanks for sharing!